WILLEMSTAD - Churandy Martina goes to the Olympics Games in Tokyo in 2020. 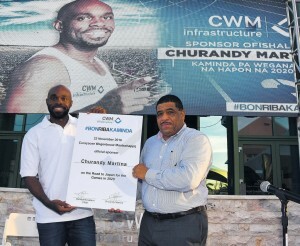 The Curaçao sprinter will be sponsored by the Wegenbouwmaatschappij Curaçao during these four years of preparations toward the Olympic. According to the Road Construction Company, there has never been a local athlete who has meant so much for the island as Martina does. Churandy indicates, shortly after the Olympic Games in Rio, that he will continue for a while but he’s lacking funding. Martina finished fifth in the final of the 200m at the Games in Rio de Janeiro. The Curaçao sprinter came in 0.01 seconds short of a medal.